The UK property market has continued to demonstrate resilience and stability, with residential prices increasing by 2.6% over a 12 month period according to the Land Registry UK house price index. Overall transaction levels remain in line with recent years at a national level. Markets have continued to diverge regionally since the EU referendum, with prices now weakening in some areas of London and transaction levels dropping materially. For the past three years, we have focused our investments on higher yielding areas outside of London and have bought higher yielding asset classes to the platform, such as Purpose Built Student Accommodation and development loan bonds. In Q1 2019, we launched our first opportunistic fund, raising £2.1m to acquire discounted properties from motivated sellers with a target net total return of at least 10% p.a. Every six months, Allsop LLP, an independent, RICS accredited surveyor, re-values the residential properties on the Property Partner platform. Of the 95 properties that were revalued at 31 March 2019, 17 saw an increase compared to their September 2018 level, 65 remained unchanged and 13 experienced declines. Of the 30 properties that experienced an increase or a decrease, only five had meaningful changes. You can read more about the reasons for these changes on the individual property pages. The result was an aggregate decrease of 0.17% in the underlying value of properties in the portfolio over the past six months. This includes the impact of valuation adjustments made to Premier House, Edgware and Picture Works, Nottingham, both of which have been affected by cladding which was deemed unsafe in the aftermath of the Grenfell Tower tragedy. The remainder of the portfolio increased in value by 0.2% in the past 6 months and since purchase, properties in the portfolio have increased in value by 4.7%. You can view the comparable information provided by Allsop for each of our residential property valuations here. The revaluations have produced an average total return of 7.2% p.a. across all properties since platform launch. This is made up of 2.8% from capital growth and 4.3% from dividend yield, denoted by the blue bars in the chart below. The above total return* calculation can be found here (not available on mobile). 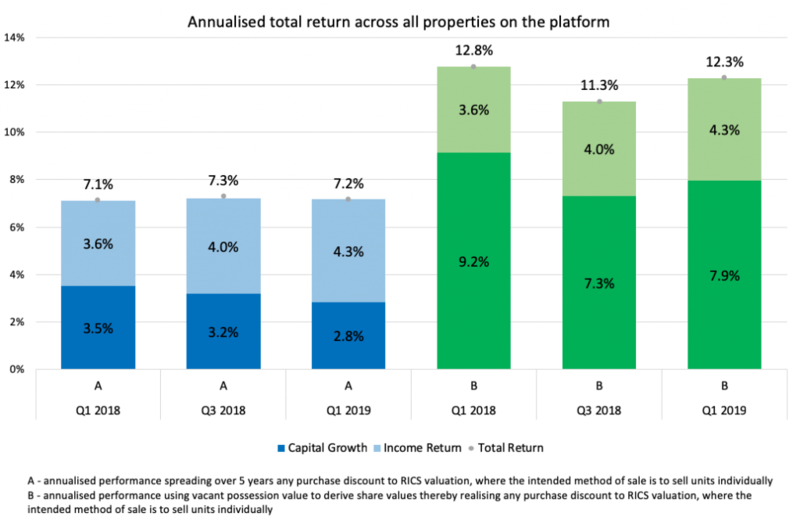 Taking into account the full discounts achieved at purchase and each property’s current valuation at the intended method of sale, the total return increases to 12.3% (denoted by the green bars in the chart above). The bars below show that the portfolio has, on average, after all fees, delivered an annual total return of 4.9% over the 12 months to 31 March 2019, including a dividend yield of 3.9% and 0.9% in capital value growth. 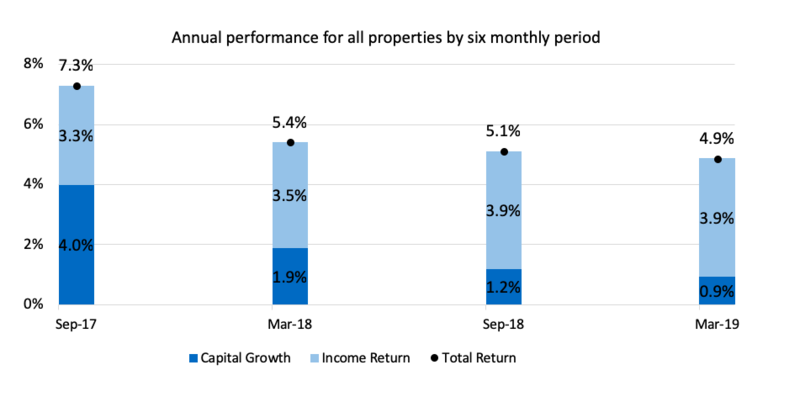 The graph below denotes the regional return profile based on 12 month performance at the end of each period, corresponding with the total return of 4.9% across the platform at 31 March 2019. 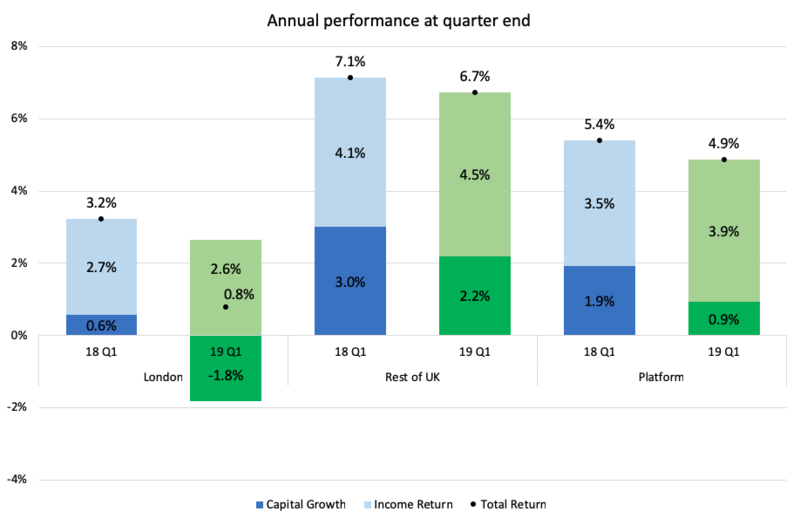 UK regions outperformed the capital in the last 12 months, with an income return of 4.5% compared to 2.6%, capital growth of 2.2% versus -1.8% and a total return of 6.7% against 2.6%. 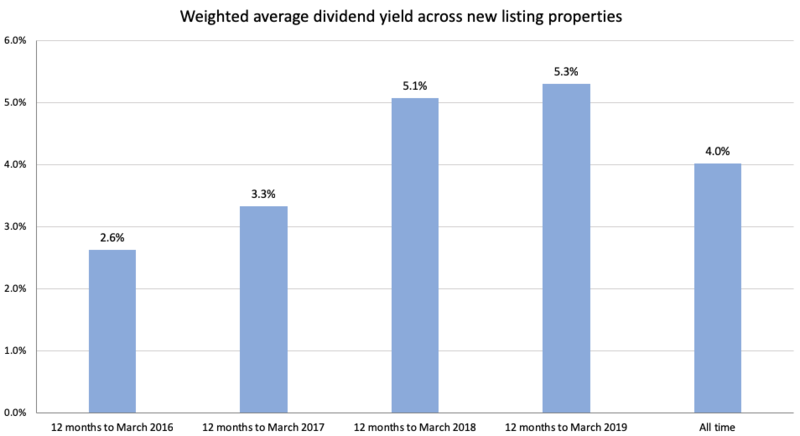 High-yielding PBSA blocks have driven a higher average dividend yield across new properties listed on the platform. Over the last 12 months, the new properties we’ve funded have had an average dividend yield of 5.3%, compared to 4.0% across all properties since platform launch. The total value of investments on the platform is £135 million with 114 separate assets for investors to select from. 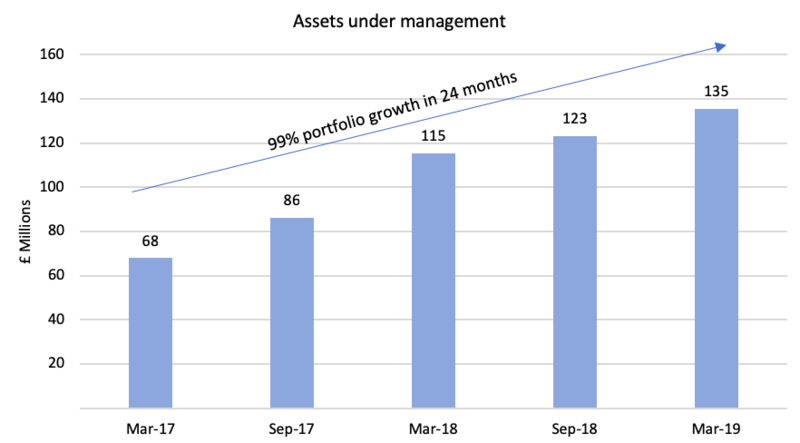 Assets under management have increased by 99% in the last 2 years and are nearly three times greater than at the time of the EU referendum in June 2016. Four property development loans funded, paying interest of between 9% p.a. and 12% p.a. In addition to sourcing properties with higher income yields, we continued to list property-backed debt investments on our platform, providing investors with the opportunity for further choice and diversification across higher yielding investments. In January 2019, we also launched our Innovative Finance ISA to enable tax free investment into these opportunities. We intend to continue to expand this part of the business in addition to our core property investment offerings, with additional property-backed debt investments scheduled for launch on platform in the coming months. We are passionate about transparency and hope this information is helpful as you consider your investment decisions. You may also like to read our Open House series where we share further information about our community, investment performance and measures of activity on our Resale market each quarter. The March update is coming soon. Click here to read the latest Open House update. Please note: when you invest your capital is at risk and past performance is not a reliable indicator of future performance. If you have any questions or comments on this article, or anything else, please call us on +44 (0)20 3696 5600 or drop us an email on support@propertypartner.co – we’d love to hear from you. *Since the launch of the platform in January 2015, properties have, after fees and corporate taxation, delivered an estimated total return of 7.2% p.a. up to 31 March 2019 ; including 4.3% net rental income (dividends) and 2.8% capital value growth. These returns are calculated six monthly and (i) with reference to the average dividend yields and price movements of properties with at least 3 months trading history on the Resale Market, (ii) spreading over 5 years any purchase discount to the RICS valuation, (iii) amortising property acquisition costs over 10 years, (iv) assuming the property remains tenanted, (v) assuming that investments are held for the long term, to the extent that the annualised impact of the Property Partner initial transaction fee becomes immaterial, and (vi) weighting each property’s performance according to their initial funding value. You can download the objective data used to calculate this estimated return here (not available on mobile). Past performance is not a reliable indicator of future performance.